Cost of sales for the period increased 87% to total $17.42 million, up from $9.30 million recorded for the comparable period last year. As such, gross profit amounted to $52.39 million, an 11% increase from $47.29 million recorded in 2017. Other Income year over year posted a 7% improvement to $573,000 (2017: $538,000). Consequently, Profit before Tax decreased by 50% from $4.50 million to $6.73 million. No Taxes were recorded for the period, thus Net Profit for the three months ended March 31, 2018 was reported at $6.73 million, an increase of 50% on the prior year’s corresponding period of $4.50 million. Earnings per share (EPS) for the quarter amounted to $0.06 (2017: $0.04).The twelve-month trailing EPS amounted to $0.20. The number of shares used in our calculations is 106,000,000. 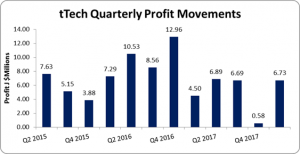 Notably, tTech’s stock price closed the trading period on May 11, 2018 at $5.87. As at March 31, 2018, the Company reported total assets of $232.08 million, a 16% increase when compared to $199.35 million in 2017. This was as a result of an increase in ‘Investments’ and ‘Accounts receivable’ to $26.36 million (2017: $2.30 million) and $95.30 million ($39.59 million). Additionally ‘Cash and Cash Equivalents’ increased to $46.65 million relative to $34.16 million for the first quarter of 2017. Shareholders’ Equity as at March 31, 2018 was $185.10 million compared to $168.47 million for the comparable period of 2017. This resulted in a book value per share of $1.75compared to $1.59 the prior year.